iPad Air / iPad Pro / Microsoft Surface Pro / Samsung Galaxy Tablets Camera Tripod Mount Adapter Kit : allputer.com - Accessories for all your Portable Electronics & Computers! This universal Tablet / iPad Tripod Mount safely and securely mount your large smartphone, iPad, Nexus and more with a standard thread. Perfectly calibrated to snugly fit without damaging your tablet, a great and amazing tool for photography lovers. 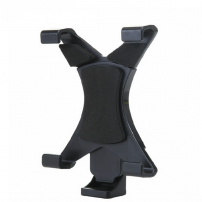 - Directly have your Tablet / iPad Mount on your Camera Tripod for phototaking, unlike other adapters, this adater kit allows you to mount your tablet / iPad stands firmly and right vertically to your camera tripod. - You can even lock the tablet / iPad, just turn to lock. It is a very secure adapter! - It is case compatibe, it is not necessry to take off your case before installing to this kit. - This is an OEM product, not a product from Apple Inc nor Samsung or any other brand names mentioned. - If you need a product for Samsung Galaxy Note Pro / Galaxy Tab Pro / Microsoft Surface Pro / Apple iPad Pro, please consider another product from us, please search AP003671. - Net Weight: 93g approx.